Looking for Reynolds Station: An Archaeological Investigation in Knox County, Tennessee | Cultural Resource Analysts, Inc.
Tennessee has been the location of many archaeological discoveries. The state’s landscape varies from relatively flat lands to the rolling landscape of eastern Tennessee. There are an abundance of both prehistoric and historic sites in Tennessee. 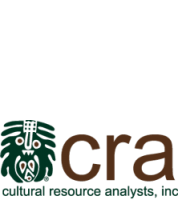 Cultural Resource Analysts, Inc., is fortunate enough to have an office in Knoxville, Tennessee, which has conducted numerous archaeological investigations. In April of 2013, CRA worked to document the location of Reynolds Station in Knox County, Tennessee. The phase II investigation was required for an intersection improvement in the area. A proposed access road had the potential to adversely affect the site, so it was necessary to determine if the site was eligible for the National Register of Historic Places. One of the goals of the project was to determine if, in fact, Reynolds Station had been located on the site. An autobiography by John Reynolds in 1855 stated that his grandfather had built a station in the vicinity of the project area and that he had lived in a house with his parents near the station. Likely based on this account, local historians believed that the site might have been the location of the station. Preliminary archaeological work in 1994 (Longmire 1994) recovered some evidence of an early-nineteenth-century occupation but no definitive proof of it being Reynolds Station. Historical research indicated that the property was initially owned by Stockely Donaldson before being purchased by Joseph Hinds as a 500-acre tract in 1794. Although Hinds was said to be building a blockhouse, the location of this structure is not known, and no evidence of one was located within the project area. Hinds sold a portion of the property to George Perry in 1799. Perry built a two-story log house on the property shortly thereafter. Perry died in 1836, and the property was sold to William P. Harbison in 1842. Perry and Harbison were both slave owners. Harbison deeded the property to his youngest daughter, Sarah, and her husband, J. F. Neal, in 1865 before his death in 1868. Members of the Neal family retained ownership until the property was purchased by the Cardwells in 1929. The Cardwells demolished the log house and built the extant frame house. As it stands, it is safe to say, based on the investigation, that Site 40KN275 is not Reynolds Station. Although the investigations did not reveal the location of Reynolds Station, the excavation of 10 features at Site 40KN275 provided insights into the activities that took place on the property. The archaeological field research resulted in the excavation of 172 shovel tests, six test units, and seven trenches totaling 4,070 sq ft. These excavations revealed 54 archaeological features, 10 of which were partially or completely excavated. Features 1, 2, and 9 were shallow root cellars likely associated with slave cabins constructed by George Perry. Feature 15 was a privy also in use during Perry’s occupation of the site. Feature 18 was a sorghum furnace most likely constructed by William Harbison and used by J. F. Neal. Feature 8 was a large rectangular privy that was filled during the time that J.F. and Sarah Neal owned the property, and Feature 46 was a pit filled with debris that appeared to date to the Neal occupation as well. Other features could not be directly associated with a specific period of occupation, including Features 10 and 13. Feature 5 was found to be a tree root. In all, 3,605 artifacts were recovered from all contexts. The ceramic assemblage was particularly useful in dating the features and allowed for the association of the features with specific families. Based on the results of the archaeological evaluation of the site, it has the further potential to yield important information on the early Euro- and enslaved African-American inhabitants of east Tennessee and Knox County, on the material culture of the enslaved, and on the changes that took place to the landscape through time. Recently, CRA archaeologists went back to the site to begin phase III fieldwork on the site. Make sure to check the blog for updates on what they find.